We’re currently on spring break this week, but I wanted to post some of the Easter activities (and some of the other work) the kids worked on last week. Because we start school in June, we are actually winding down our school year right now. April will be fairly light as we tie up some loose ends, and then May will be off as we switch gears and prepare for the next year. In June, Jedi will be starting his 3rd grade curriculum, Monkey will be doing kindergarten work, and Bug will “officially” be starting the preschool curriculum! Here are a couple of pictures from last week! Monkey using some Easter Bunny tongs to match plastic eggs. 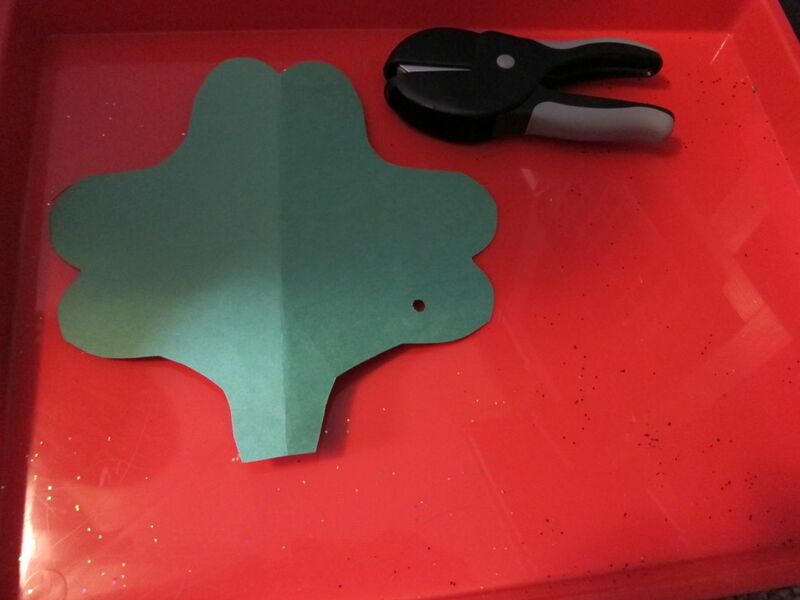 This work is also good for transferring the eggs from the tray to the egg carton. Decorating the seasonal tree. 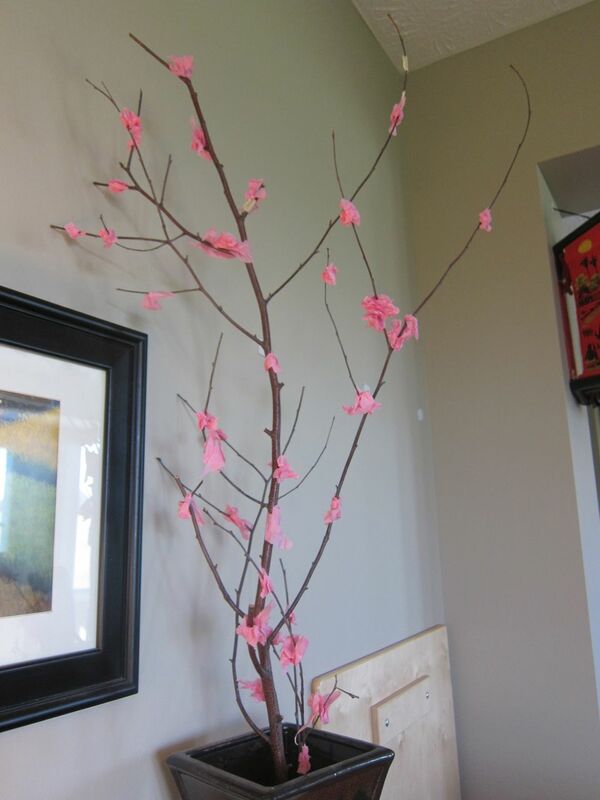 This time I gave the kids pink tissue paper squares and they crumbled it to make apple blossoms. Here are some pictures of some of the other things the girls have been working on. 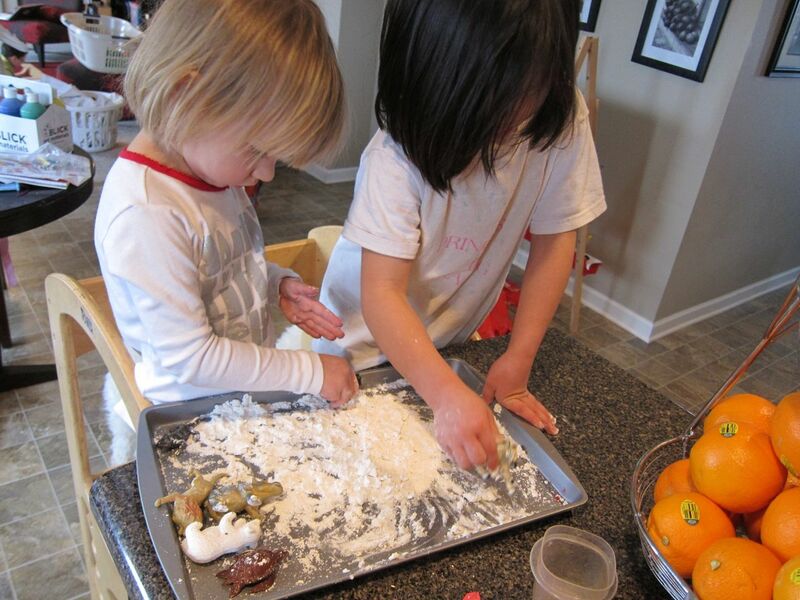 Bug and Monkey using little plastic animals to make footprints in the flour. 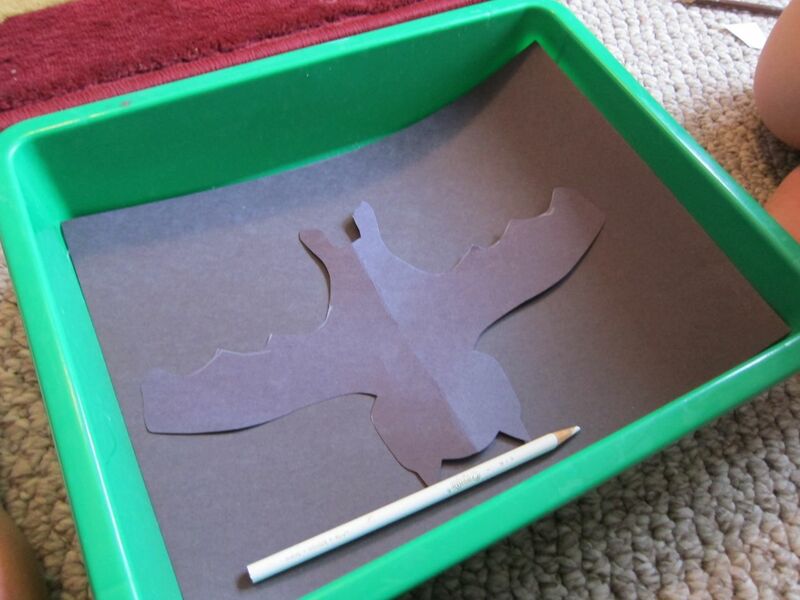 The kids traced an outline of a bat with white pencil. Then they used the pin punch to punch holes in the outline. 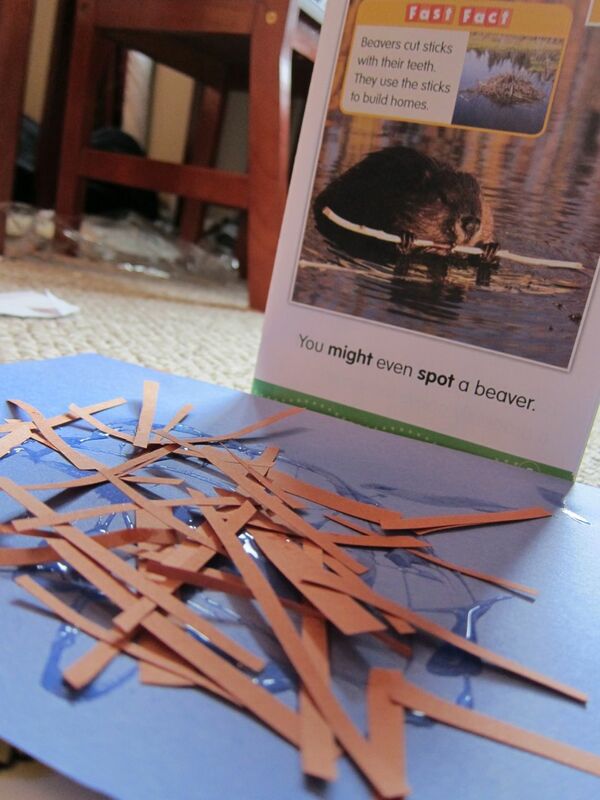 The kids also learned about beavers and beaver dams. 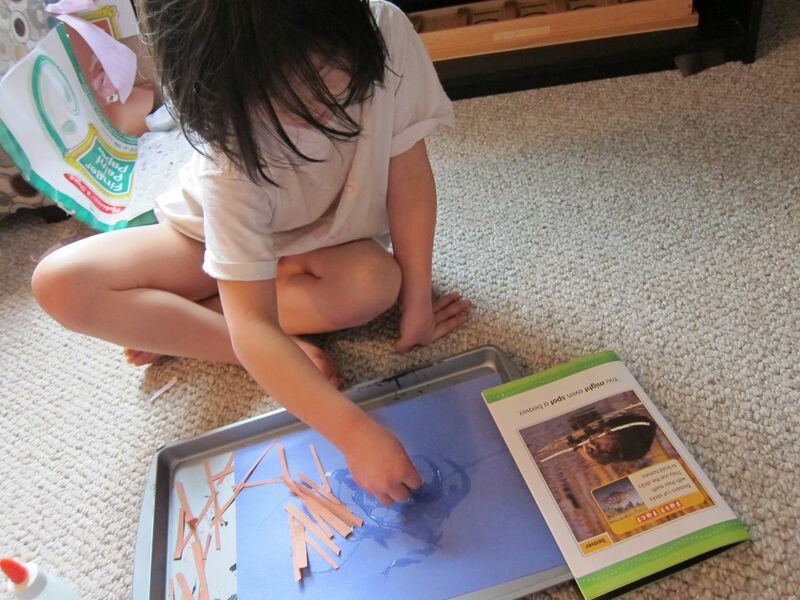 Here, Monkey is looking at a picture of a beaver dam and making her own out of brown paper strips and glue. Learning about what seeds need to grow. 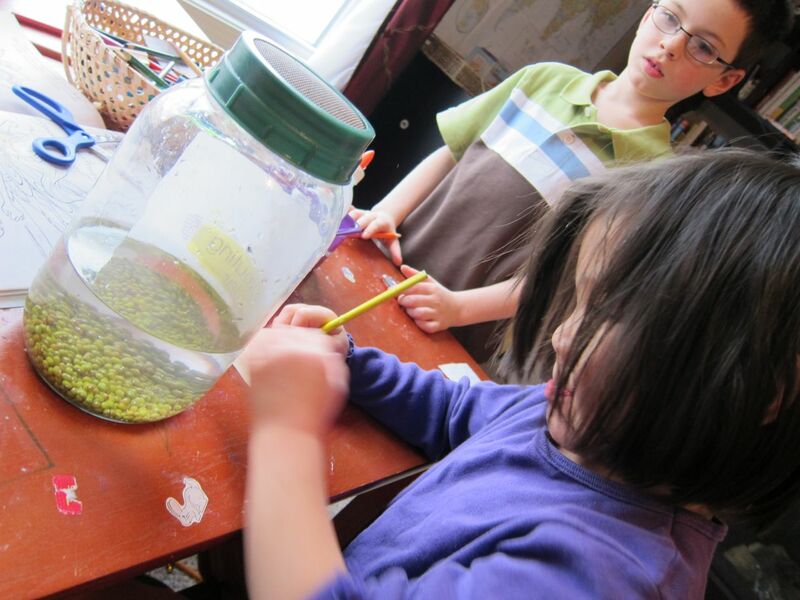 Here, Monkey and Bug were working on sprouting bean sprout seeds. Monkey has been *begging* to start having circle time (I think she learned about it from Blue's Clues. LOL!) 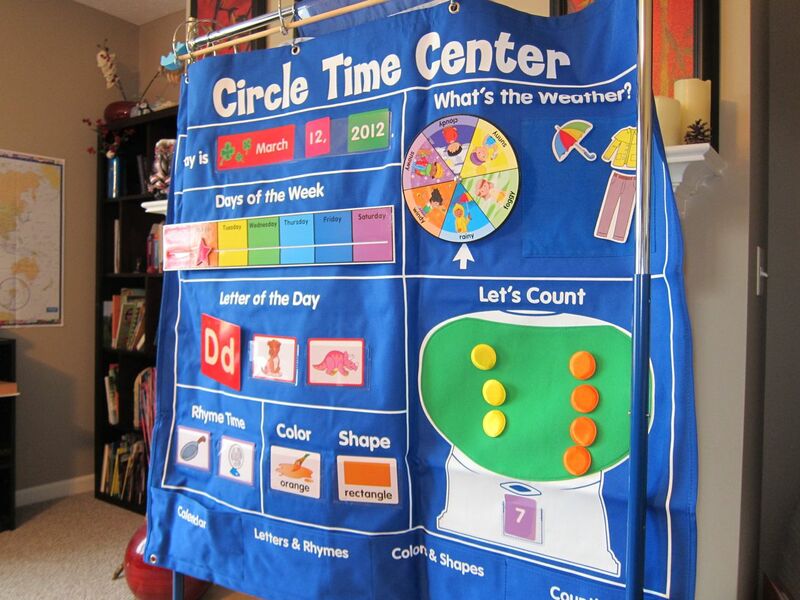 So, I picked up this really awesome pocket chart from Lakeshore Learning. 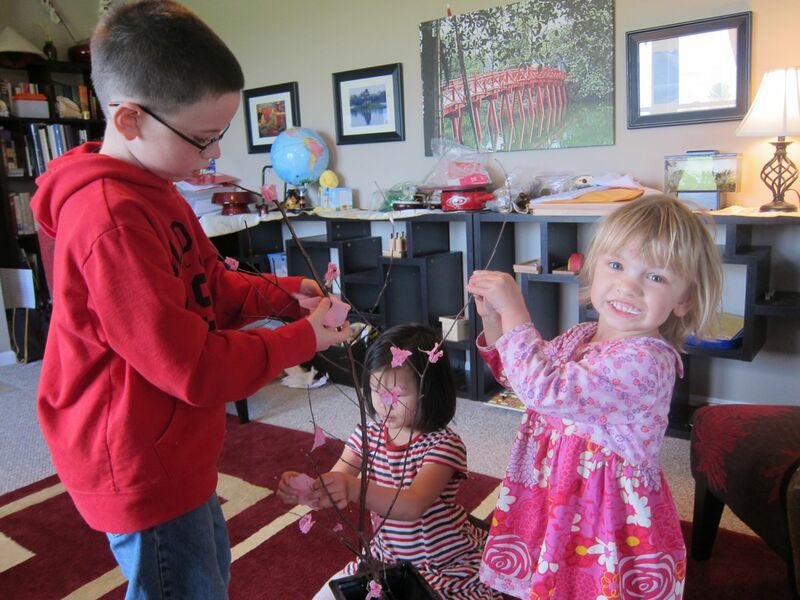 The kids especially love finding the appropriate clothing for the weather and doing math problems with the gumballs. Bug works on counting and sorting, Monkey works on addition, and Jedi works on multiplication. 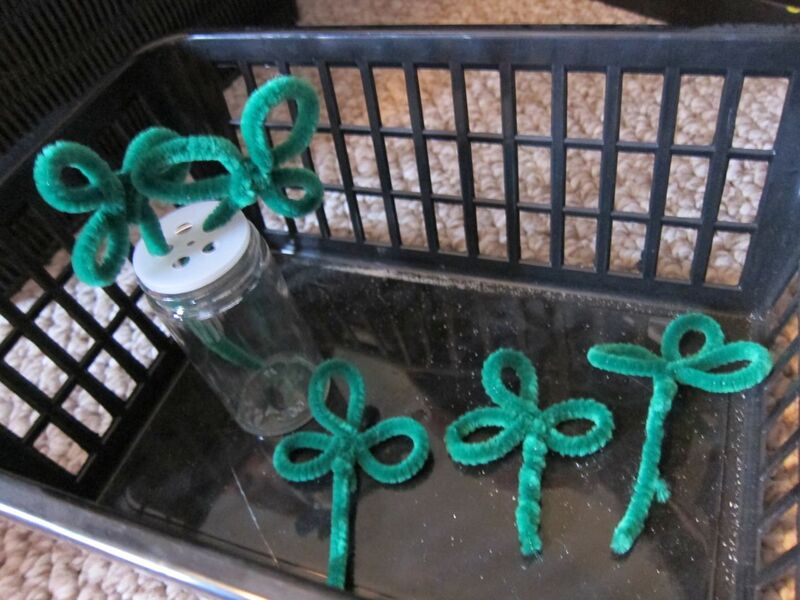 Putting pipe cleaner shamrocks into a spice jar. Learning the colors of the rainbow. 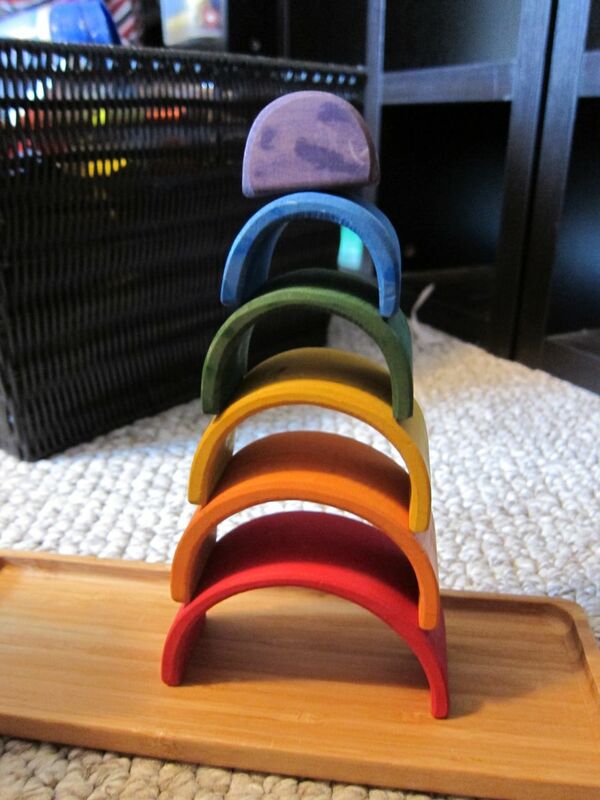 And stacking the rainbow into a tower! I put some yellow and blue food coloring in some shaving cream to work on color matching. 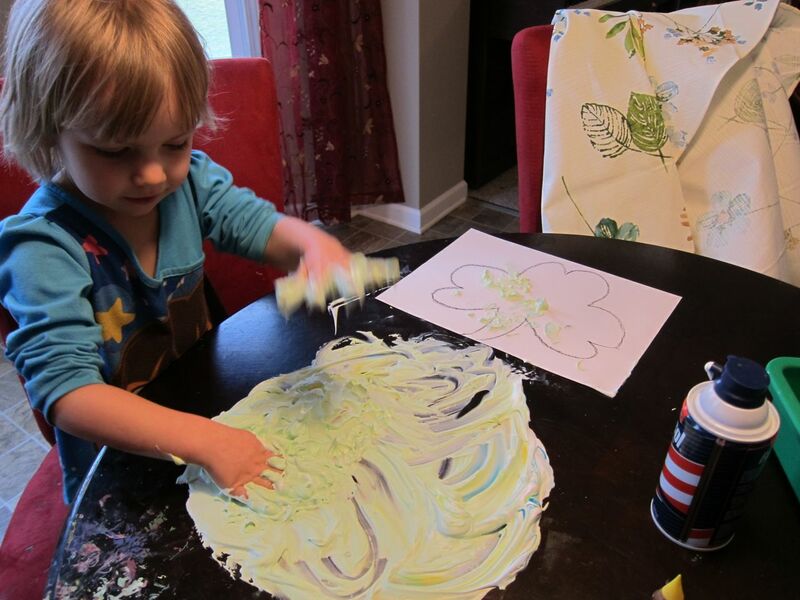 They also used the shaving cream to paint shamrocks. Monkey has some touch aversions, so she started by putting her hand in a bag to mix the shaving cream. 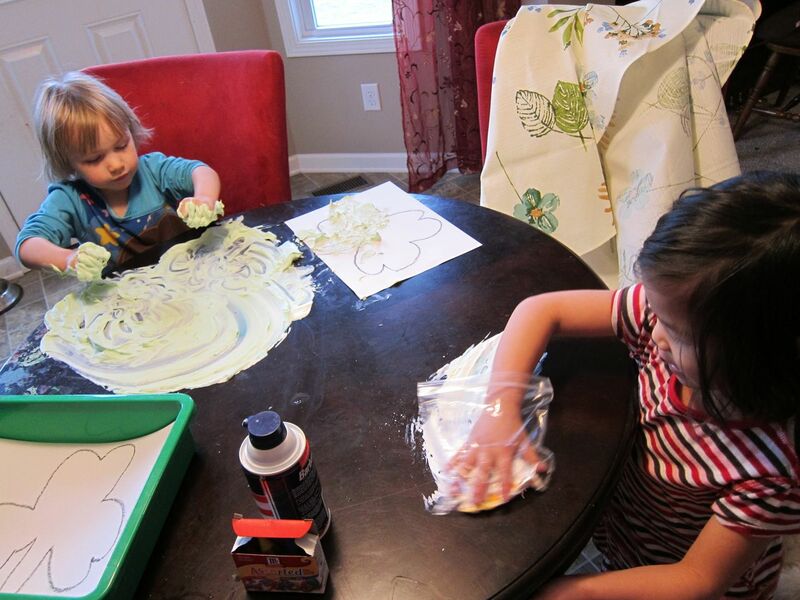 She took her hand out of the bag to paint with the shaving cream, but she wasn't exactly thrilled about it. Lately, it’s become very clear that Bug has her own very distinct personality. She’s not one to follow the crowd, that’s for sure! And she’s perfectly comfortable voicing her opinions, likes, dislikes, and desires. The first one that’s pretty obvious from the pictures is clothing. Bug will now only wear 2 things…what she calls “princess dresses” (long flowy dresses that twirl) or nothing. And she doesn’t want to get the princess dresses dirty, so if she thinks something will be messy, she decides she’d rather wear nothing at all. And this princess dress thing has become an obsession…she will not put anything else on. It *must* be a dress, and that dress must be able to twirl. Complete with silver sparkly shoes. And at night, it *must* be a “bedtime princess dress” (nightgown). Now, contrast that with what you see below…she might be obsessed with looking like a princess (and her favorite line is “But mama…I a princess! I the BOSS!” said in a very matter of fact 2 year old way), but she is also one to get down in the dirt (sans the dress of course) and play with bugs. Or paint. Or food. I love 2 year olds…they are full of personality, and full of contradictions! Bug loved to work with the dot markers this week. Here, she's putting spots on the ladybug picture. 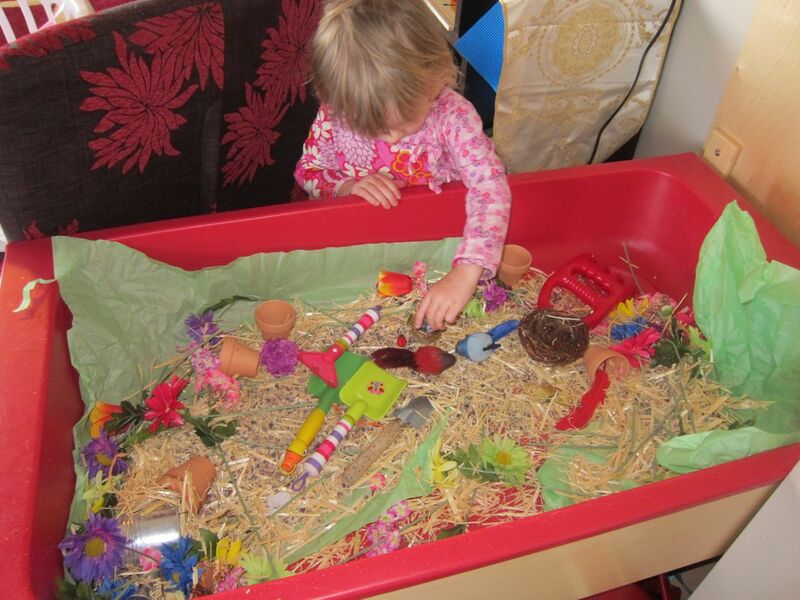 Playing with the birds' nests in the sensory table. Bug *loved* this work...painting ladybugs on rocks. Observing the butterfly display with a hand lens. 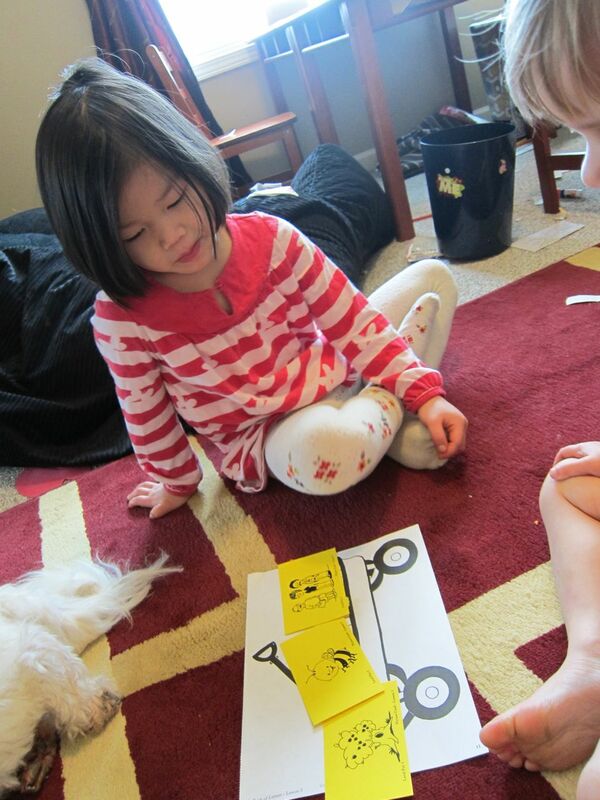 Bug also liked this craft (do you sense a theme...she loves crafts just like her big sister!). The jars have diluted food coloring in them. Using the eyedropper in the jars, Bug had to transfer the colored water to the coffee filter. Once she was done, we let the filter dry, and then used a black pipe cleaner to help make a butterfly. Observing the bugs in acrylic with the hand lens. Pouring glass beads into the small dishes. We haven’t dropped off the face of the earth, despite my lack of posting. 🙂 The weather is finally getting nicer here, so we’ve been out of the school room and spending our days outside gardening and enjoying nature. I’ve also been spending this time getting prepared to start homeschooling Jedi in June. We got our homeschooling approval letter from our county, and Jedi’s officially excused from school after the end of this school year. We have a guest living in our garden beds! I went out to pick salad greens, and found this killdeer egg. Day 2...a 2nd egg showed up! And here's mama bird! She lets me go over to the garden, but if the kids come over, she does some cool theatrics. Killdeer pretend to have a broken wing if something comes too close to the nest. They hope that the predator will follow the easy prey (hurt bird) and leave the nest alone, but then when you come close to the bird, it up and flies away. The broken wing 'dance' is amazing! Mama bird watching me harvest. Day 3! A third egg! Turkey vulture really close to the house. The garden beds--where the killdeer nest is has the herbs, next to it has the salad greens, spinach, broccoli, and oregano. There is also red potatoes, cilantro, onions, green onions, cantelope, bush beans, and cucumbers. The first box is strawberries, the second box has green peppers, banana peppers, hot peppers, and lemon basil. The far box has tomatoes and basil. This week, we decided to try something new. 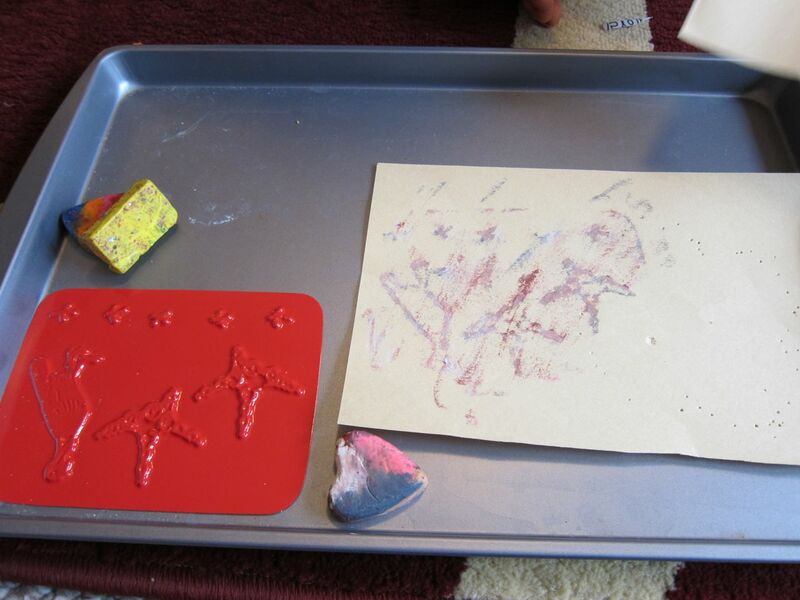 For the past year, we’ve been using Karen Tyler’s Montessori albums. However, with the addition of having to homeschool for 2nd grade too starting in the summer, I wanted to try something with a little more structure to it, so that I had things laid out for me daily. 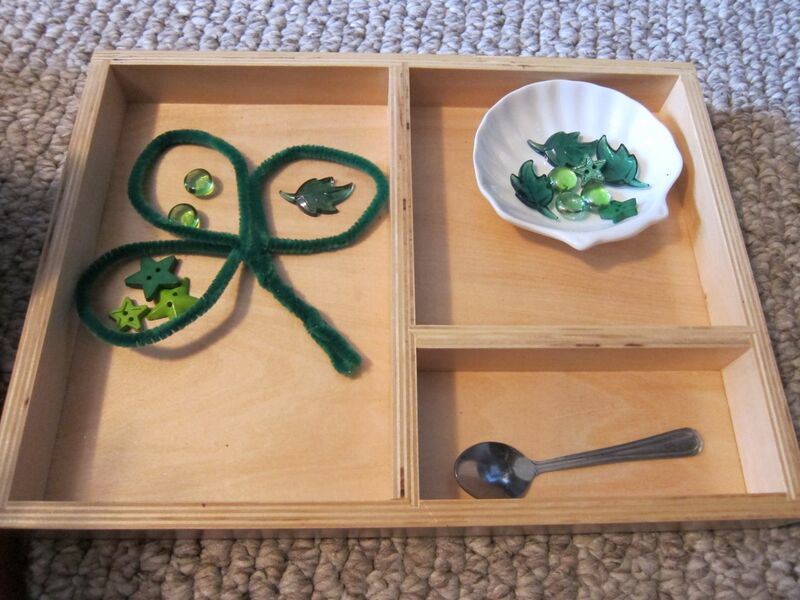 I started using New Child Montessori, or rather, using it as a basis, but continuing with the Karen Tyler stuff (and just adding in my own personal touch as well). I do love the New Child curriculum so far…it’s more of “Montessori-inspired unit studies” than pure Montessori, and for us, that’s fine. 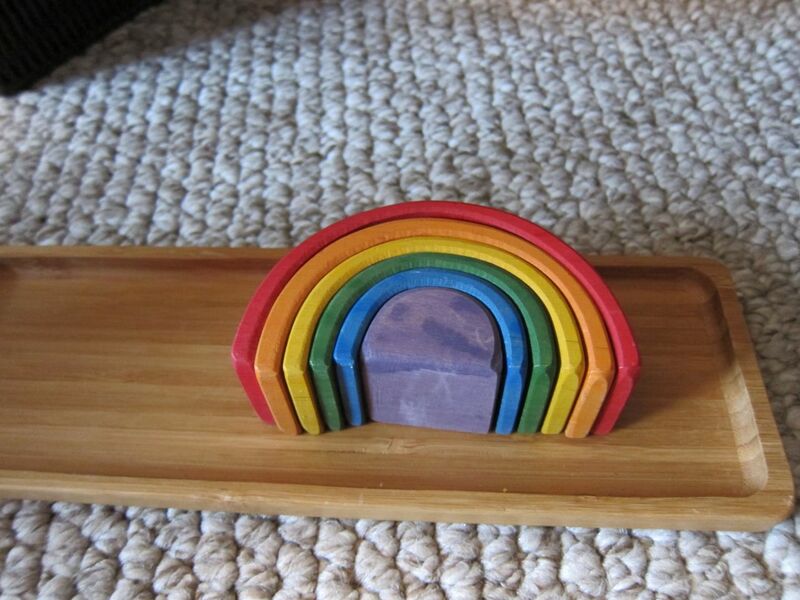 It’s not like homeschooling is pure Montessori anyhow…LOL! This past week, the focus was on reptiles of our home state, as well as the world. We mainly concentrated on Ohio snakes and turtles, but we touched on crocodiles and komodo dragons as well. 🙂 Even Bitty Bug got into the lessons this week! She loved the snakes! One of the things I really like about our new curriculum (other than having the entire sequence laid out for me. LOL!) is the addition of a “circle time” and “yoga time”. 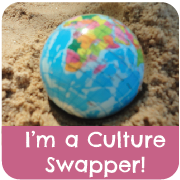 While we don’t follow the New Child schedule exactly (because it’s laid out like a traditional school day, which is just not necessary when you only have 2 children in the room! 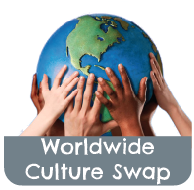 ), we do add in the circle time date, weather, and story stuff, as well as the yoga time. The yoga helps focus the girls, and the circle time gives me a chance to give the lessons before things get too crazy. So, I’m really liking this program so far! Bitty Bug dressed for baking! One of the best parts...licking the spoons! And of course, we added green "grass" frosting and a gummy worm! As Bug gets older, it’s interesting to see her natural progression from the work of an infant/young toddler to the work of a preschooler. It seems like Bitty Bug is starting to resist the work that’s been set out for her, and more and more she is gravitating towards the preschool level work. 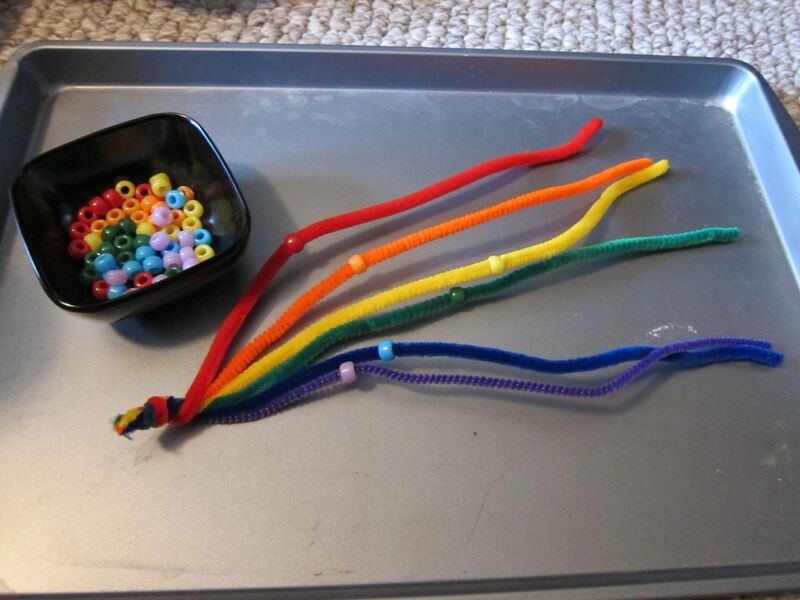 Unfortunately, she gets very disappointed that she’s not really ready for that work–while it looks really interesting to her, bead chains just aren’t appropriate work for a young 2 year old. 😉 Part of me thinks she’s just trying to copy what her sister does, and if she was in a regular classroom for kids her own age, she’d probably still be gravitating towards the younger works. But part of me also sees that she genuinely is curious about the work for older children. 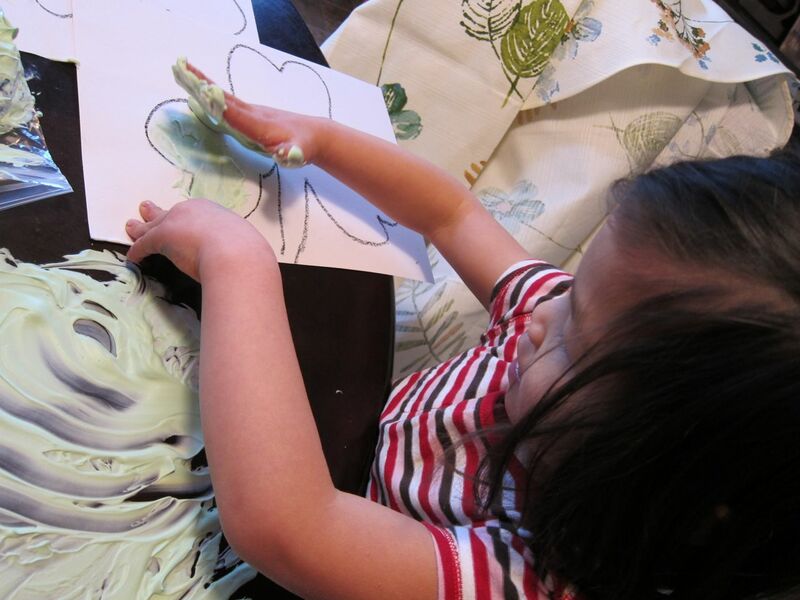 She already knows her colors, can count to 10 (in English, Spanish, and Vietnamese (thanks to the Vietnamese language CDs we play for Monkey), and is so proud of herself when she does that. So, I see her trying to work on things like Color Box 2 or work where she has to count the objects. So, it really is interesting to me to see her progression! 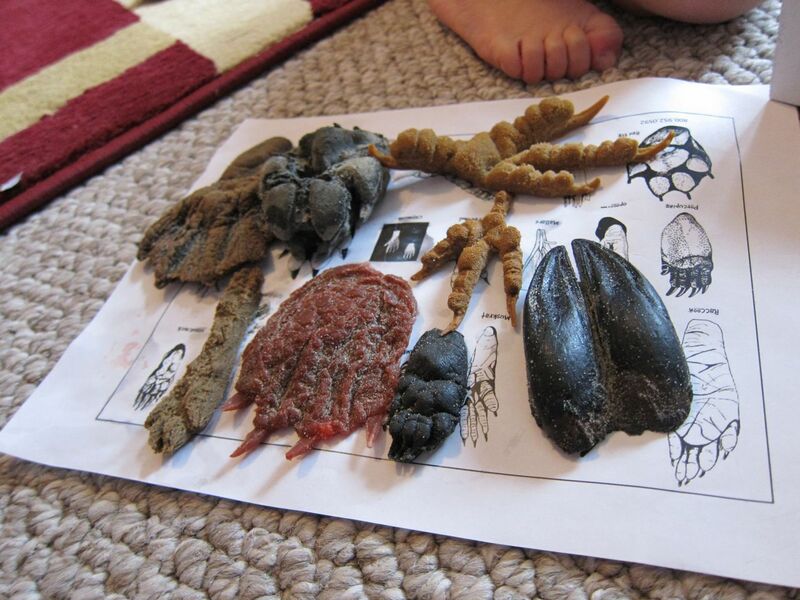 Bug really enjoyed the turtle lesson....and she loved wearing the turtle shell on her back!